Is your horse SPEEDY or SUPER? With the SPILLERS mash menu ever expanding we thought we should give you the low down on the differences between the two to help you choose the most suitable one for your horse or pony? Firstly, why choose a mash? They are great for good doers as once they are soaked they expand to fill the bucket tricking your weight watching friend they are eating a larger dinner than they actually are! They are great at increasing water intake, there is evidence that feeding soaked feeds can encourage additional drinking as well as providing water through the feed. They are ideal for senior horses and ponies that can no longer manage long fibre in the form of hay and haylage. 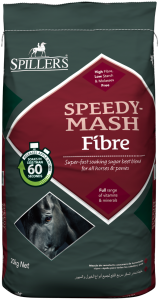 SPILLERS SPEEDY-MASH Fibre is high in fibre, low in starch and molasses and cereal free containing a full range of vitamins and minerals alongside prebiotic FOS and probiotic live yeast for digestive health. SPILLERS SPEEDY-MASH Fibre also contains quality protein to help maintain topline and muscle tone, ideal for those on restricted calorie rations. As a bonus it’s mega delicious containing an apple aroma that slowly releases during soaking. Everyone!! 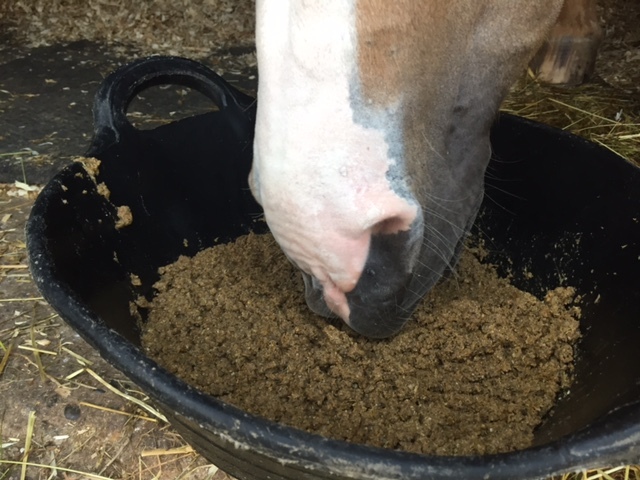 Seriously SPEEDY-MASH Fibre is ideal for all horses and ponies due to its gut friendly formula, whether you have laminitic pony, an elderly horse with poor teeth that is maintaining their weight well, a chubby cob or a performance horse that is a shy forage feeder SPEEDY-MASH is ideal. It’s highly versatile and totally up to you how you feed it to meet your horse or pony’s individual needs. It can be used as the full bucket feed, an addition like you would feed sugar beet or as a complete replacement for forage if you have a senior that can no longer manage any long stemmed fibre, but still maintains their weight well. SPILLERS Senior Super-Mash is super in so many ways. Just like it’s speedy sibling it’s low in starch, high in digestible fibre and free from whole cereals and molasses making it the ultimate senior mash for condition and gut health. Alongside its nutritious fibrous ingredients that include sugar beet and soya hulls it contains triple digestive support in the form of prebiotic FOS and MOS and probiotic live yeast. With good quality protein to help maintain muscle tone and topline and added vitamin C and E to support the immune system. 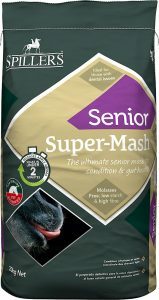 Senior Super-Mash although is senior by name by nature it has a much broader application, its higher in oil, protein and energy than SPEEDY making it ideal for all horses and ponies needing a bit more help to build or maintain their weight. Like SPEEDY it can be used as an addition in the bucket like sugar beet, as the complete bucket feed or as a partial or total hay replacer. In terms of additional goodies it contains a higher level of live yeast and vitamin E alongside MOS and vitamin C when compared to SPILLERS SPEEDY-MASH Fibre. For more information on whether SPEEDY or SUPER is the best option for your horse or pony call the SPILLERS Care-Line on 01908 226626. Yes SPEEDY-Mash is suitable for horses with metabolic conditions and laminitis. I feed my pony spillers Balance light and lean, would I need to continue if feeding Senior Super-Mash? This would be dependent on the quantities you are feeding. If you give the Care-Line a call on 01908 226626 we will be able to advise more appropriately for your situation. H. I am interested in buying these mashes but can't find out how much sugar they contain. Can you tell me? All the information is readily available on our website.